If you want to visit us at Stanmer, do arrange this in advance. We’re not there all the time, and Brighton Permaculture Trust has no permanent office that is open to the public. We use a number of venues at Stanmer Park, including Earthship Brighton, Plumpton College, the council offices, our orchards and our plot at Stanmer Organics. All are difficult to find, and council security gates en route may be locked, so we arrange to meet people, usually outside the Fruit Factory in the village, or outside Stanmer House. If you are meeting us here for a course, please make every effort to be on time, as we will be unable to wait for you. Please note that our meeting points are quite a distance from the entrance to the park. Allow 30 minutes to walk from Falmer Station or the bus stops at the entrance to the appropriate meeting point. Please travel by public transport if you can. Stanmer Park is located near Falmer, on the outskirts of Brighton, next to the University of Sussex. The best postcode, if you are using sat nav, is BN1 9QA, which is Stanmer House, within sight and a very short distance from our meeting place by the church. Click here for street map. Click here for satellite image. It is around a mile from the entrance of Stanmer Park to the Fruit Factory (allow 30 minutes to walk). Cycle/walk/drive up the main road through the middle of the park. Take the left-hand fork where the road splits (a one-way system). You will see Stanmer Church in front of you. If travelling by car, continue around the church to the potholed car park behind it, but please note that the bollards at the entrance are only just wide enough to allow in cars. A parking space for larger vehicles can often be found alongside the green wooden barn also behind the church. Parking is currently free, although this may change in 2017. If you are coming to a course, event or volunteering session please follow the instructions about where to meet in the confirmation email we have sent you. Please do not be late. The path to the Home Farm Orchard is across the grassy area on the other side of the road at the tower end of the church. Please do not help yourself to fruit, and please close the gate. 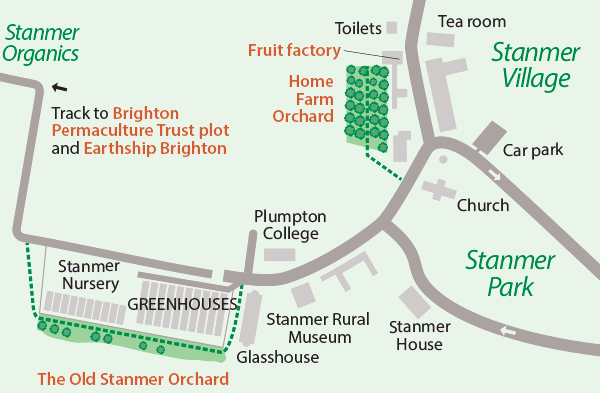 To find the Old Stanmer Orchard, turn left at the entrance to Brighton & Hove City Council nurseries, go down the side of the Plumpton College Glasshouse, and then turn right into the orchard at the end of the wall. Need directions to Racehill Community Orchard instead? Click here. Follow the road towards Stanmer Village and the tea rooms, pass the old farm house and a stable yard on the left, and the Fruit Factory is there on the left. Get information on local accommodation.